May | 2018 | What's that, UASC? Patricia Monture (later Monture-Angus), a member of the Mohawk Nation from the Six Nations Grand River Territory, was an incredible force for change in the realm of Aboriginal women’s rights during her lifetime. She obtained her BA in sociology from the University of Western Ontario (1983), her law degree from Queen’s University (1988) and her Masters in law from Osgoode Hall Law School (Toronto) in 1998. In 1988 she filed a suit in Ontario’s Supreme Court arguing that as a member of a sovereign nation, she should not be required to take an oath of allegiance to the Queen in order to join the Ontario Bar. In response, the Law Society made the oath-taking optional. 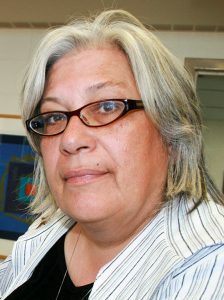 Monture taught law at both Dalhousie University and the University of Ottawa before being offered a position in the Department of Native Studies at the University of Saskatchewan in 1994. She was granted tenure in 1998 and obtained full professorship in 1999, and was during this period one of very few Indigenous women in a faculty position on campus—at one point being the only Indigenous person in the Department of Native Studies. In 2004 she joined the sociology department and became the academic coordinator of the Aboriginal Justice and Criminology Program (also known as the Indigenous People and Justice Program). Her work on Indigenous and women’s rights stretched far beyond her activities on campus, and she served on a number of major inquiries including the Royal Commission on Aboriginal Peoples, the task force on federally sentenced women, and the task force on the use of solitary confinement in federal prisons. In 2009 she was given an Honorary Doctor of Laws from Queen’s University, and she was also a recipient of the Sarah Shorten Award for the advancement of women. She passed away at the age of 52 in 2010. A center for student success was opened posthumously in her name at the University of Saskatchewan. Articles by Patricia Monture : on topics such as Indigenous people and the law, child welfare, Aboriginal women and justice, and colonial attitudes. OCN article: on Patricia’s involvement in the creation of the Canadian Museum of Human Rights (2009). Tribute to Patricia Monture : Published in the winter 2011 edition of the Arts & Science newsletter. Guide to Patricia Monture’s papers at the University Archives and Special Collections. For links to further Indigenous Resources accessible through the University Library and Archives and Special Collections, check out this post! This entry was posted in Archival Holdings on May 16, 2018 by Stevie Horn.